This is a mixing system. 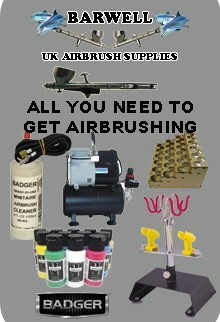 A Badger Air-Brush Co. product. Metalsmith is an acrylic metal paint product. It is essentially a simple do it yourself process kit that provides artists a limitless range of acrylic metal paint, and an ability to easily age the created metals from new to ancient. The Metalsmith product is composed of two principle mixing components and three, new to ancient, aging bases. You can use the simple mixing recommendations we've provided to create most common metals or, through your own imagination and experimentation, you can easily develop your own metal variations and creations. The first of the two principle mixing components is Metal-look. It will be in every metal mix, and is the mix component that will give the metal appearance to every metal you create. The second mixing component is a varied selection of Metalsmith Ores: Gold, Bronze Copper, Carbon Iron, Blue, and Red. These are essentially translucent colors that will be used to create the colorations of the various metals you create. To anyone more familiar with classical art and color theory, the basic principle of this kit will not be a mystery. The Gold, Blue, and Red Ores will represent the three primary colors central to every color mix. The Bronze Copper Ore will act as the other staple mixing color of any artist, Bumt Sienna. And finally, to complete the group of Ores, Carbon Iron is used as black would be in any color mixing process. As you read on, you will realize that Metalsmith is a finishing product that has utility in all scale modeling applications. Regardless of your being a miniature figure artist, a military, railroad, aircraft, or automotive modeller - whether you're painting a finescale sword or gun, airplane fuselage or motorcycle tank - Metalsmith is a product that will enable you to better and more easily make your metals look exactly the same as you think the real life version of your model looks. With Metalsmith Ores and Metal-look, you will be equipped and ready to create pretty much any metal you desire, and with Metalsmith aging bases you can age your metals as desired as well. We do recommend you read the rest of our instruction to fully understand the Metalsmith product and how it works. For painters not accustom to color theory and color mixing, we have provided some mixing recommendations for creating many common metals. Where you go from there in your Metalsmith metals creation process is entirely up to you.